On a tight budget? 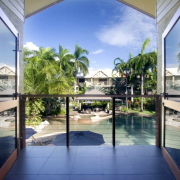 A holiday to Port Douglas does not have to break the bank. 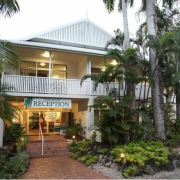 There are many budget accommodation options in Port Douglas where you can find your own little piece of luxury, and have the best holiday ever. Budget accommodation has evolved to a whole new level these days, gone are the cheap hotel stereotype - a small dark room, dreary bedspead, leaky tap, outdated furniture and an uncomfortable bed. Today you will find style, functionality, value for money and atmosphere. Being on a budget certainly does not comprimise your holiday experience. You will find a number of budget properties in prized central locations either directly on Macrossan Street, beachfront or just a stones throw from all the action. Many of them have their own charming character and theme such as the Mediterranean style of Villa San Michele, the exotic Club Tropical, and contemporary Oaks Lagoons. Additionally you will find some budget properties offer bonus services such as free internet and light continental breakfast. Budget stays allow you to save on your accommodation so you can put more into exciting holiday adventures! If location is important to you then here is our pick of budget properties located right on Macrossan Street. Le Cher Du Monde offers one bedroom self-contained holiday apartments with Spa and balcony. The property is best suited to singles and couples. The cool tropical design of the apartments allows for open plan living, with a sliding louvre door that can open up the bedroom into a large living space. 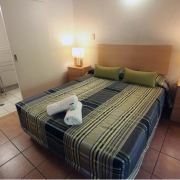 The apartments are fully equipped providing all you need for a simple getaway. Club Tropical is situated in a prized location right on the corner of Macrossan Street overlooking the parkland where the Sunday Markets take place. Step out your door and all the restaurants, boutiques and cafe's are right there. This property has lots of character with many studio rooms furnished with bamboo and bright exotic colours. All studio's have equipped kitchenettes that are situated on private balconies. Villa San Michele offers boutique Mediterranean style air-conditioned very spacious Two Bedroom, Two Bathroom Apartments and One Bedroom self contained apartments, great for families and friends. Nearby properties include Palm Villas that is located just around the corner from Macrossan Street and features One Bedroom Apartments. Further afield is the Oaks Lagoons offering excellent value contemporary Studio, One and Two Bedroom Apartments with the added afeatures of a spa bath, plunge pool or swimout. Many families are on a tight budget these days, but it doesn't mean having to give up your favourite holiday. Port Douglas is an ideal destination for families and we have some fantastic, affordable family-friendly accommodation so that everyone can enjoy this tropical paradise. 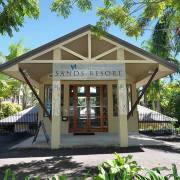 The Port Douglas Sands Resort is a family-friendly retreat, located within walking distance to both Four Mile Beach and Macrossan Street. Featuring a comprehensive mixture of spacious one, two and three bedroom apartments which have been specifically tailored to suit the needs of today's family holidaymaker, and provide a comfortable "home away from home". Choosing self contained holiday accommodation can cut down the expense of eating out, and all apartments at the Port Douglas Sands come with a fully equipped kitchen including utensils, conventional oven and microwave oven, refrigerator and dishwasher. A light self-serve continental breakfast is included in the rate at the poolside cafe, making for an easy start to an exciting day of adventures. Reef Club Resort provides a perfect base for families to explore Port Douglas village, Four Mile Beach and the surrounding region. All one and two bedroom apartments are air conditioned and come fully equipped with kitchenette facilities with a microwave, ceiling fans, cable TV, bath, hair dryer, ironing facilities and a balcony with outdoor setting. The swimming pool, surrounding green lawns and timber sundeck provide ample opportunities for the kids to play. Think about the location. By choosing a property that is centrally located or within easy walking distance to the main attractions such as Macrossan Street, Four Mile Beach and the Marina Mirage, you can save on car hire or shuttle bus fares. All tours can collect from your accommodation. Package deals offer fantastic savings. Choose from a variety of pre-packaged accommodation and tour deals that have been created to suit all budgets and interests. Not only will you save $$, it also makes your holiday planning easy and hassle free as we take care of all the details for you. Our top budget package deals include the Port Super Saver comprising of 5 nights accommodation at the Oaks Lagoons, a relaxing sunset sail and a morning Daintree river cruise followed by a "safari" out to the beautiful Cassowary falls for a freshwater swim. This package is perfect for couples on a budget offering up to $455 in savings. For families we recommend the Family Fun Port Douglas package. This package includes 7 nights accommodation at the Rendezvous Reef Resort including a full buffet breakfast daily, and the Wavedancer Low Isles Cruise. The Rendezvous Resort offers exceptional value with many resort facilities to keep the kids entertained for hours.